While I love drinking Pinot and Burgundy I find writing about it much more difficult that writing about food. As a result I tend to put it off until I build a backlog of to do wine posts which usually results in most of then not happening at all. The obvious solution to this problem is to forge on and not be too precious about the whole thing so I hope you'll forgive me for not having the most detailed descriptions. At the end of the day I believe that all the descriptors are helpful but to be blunt it really just comes down to whether you thought the wine was good, great, poor or hopefully exceptional! The very friendly sommelier in City Wine Store (easily the best wine buying the the CBD) pointed this out to me when recommending the Robert Chevillon Bourgogne which at around the $50 mark seemed quite good value. This wine is not classified as 'Village' however the sommelier informed me that it is very likely that this wine was in fact 'Village' although it was not labelled as such. Ok so now to get to the point. 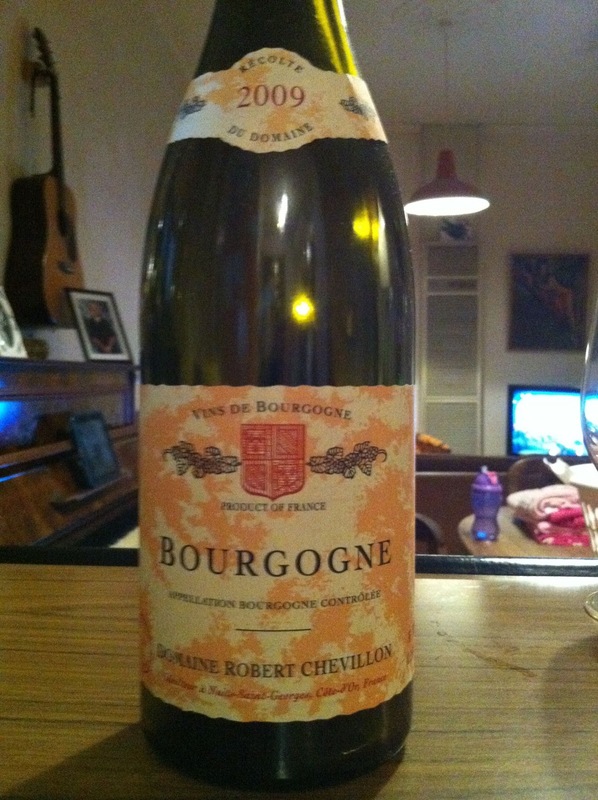 First impressions of the Robert Chevillon 2009 Bourgogne were a strong pungency on the nose that was not easily identifiable, we decided that perhaps it was hints of sulphur with a somewhat musky aroma of mould. I realise that doesn't sound great and we were certainly taken aback by it. I decant all my wines and we decided to let this sit for a little while to see if the pungency blew off with exposure to a bit of air. After about 20 minutes we tried it again and were pleasantly impressed by how the nose had mellowed considerably, although traces of the initial pungency remained. The wine exhibited a clean clear clarity with a dark intensity. The flavour was mildly plummy with a slight amount of tightness in terms of acidity. Overall the wine was enjoyable with a nice length and balanced tannins once you got past the confronting nose on entry. In conclusion, I rated this wine Good but not Great and was left a bit perplexed about how useful this wine was a tool for learning. 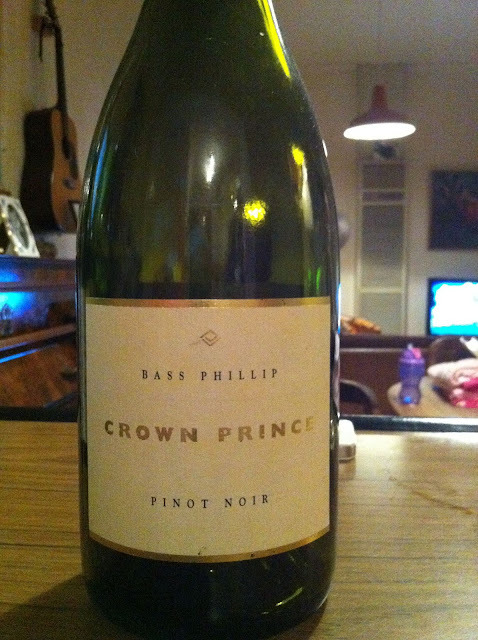 Next up is the Bass Phillip Crown Prince 2010 Pinot Noir. Phillip Jones is pretty much infamous for his excellent Victorian Pinot and given that he is one of a only a few high quality (ie high cost) Gippsland producers I have a strong interest in his wines. From memory, the Crown Price was around the $60 mark which compared to the other Bass Phillip wines is probably a good price, his premium vintage sells for around $130 with some of his other vintages selling for the $90 mark. Yes I am looking for any excuse to try them all! In terms of appearance the Crown Prince was decidedly different to the Robert Chevillon, the clarity was much duller and I suspected that perhaps it was unfiltered. I have a soft spot for unfiltered wines, for some reason I really like the powdering dullness of intensity that they display. Maybe its my palate associating the intensity with the wonderful funky goodness typical of a lot of unfiltered wines. The colour was quite dark for a younger pinot, I rated it ruby/garnet although my notes from drinking these wines are from before I dicovered the colourlovers blog which has an excellent guide for assessing the colour of wine. You can check it out here, I suggest bookmarking it on your iPhone or iPad. On entry the wine showed a degree of spritziness toward the front palate, I associated this with the acidity and noted that this mellowed considerably after a few minutes in the glass. The aroma was absolutely wonderful musky earthy funk and a great exponent of what I associate Gippsland Pinot to be. Flavour wise it had the usual high level of red fruit that I have come to expect from the younger Australian Pinot. This was complimented perfectly by a nice touch of mild oak. In conclusion, I rated this wine Great. 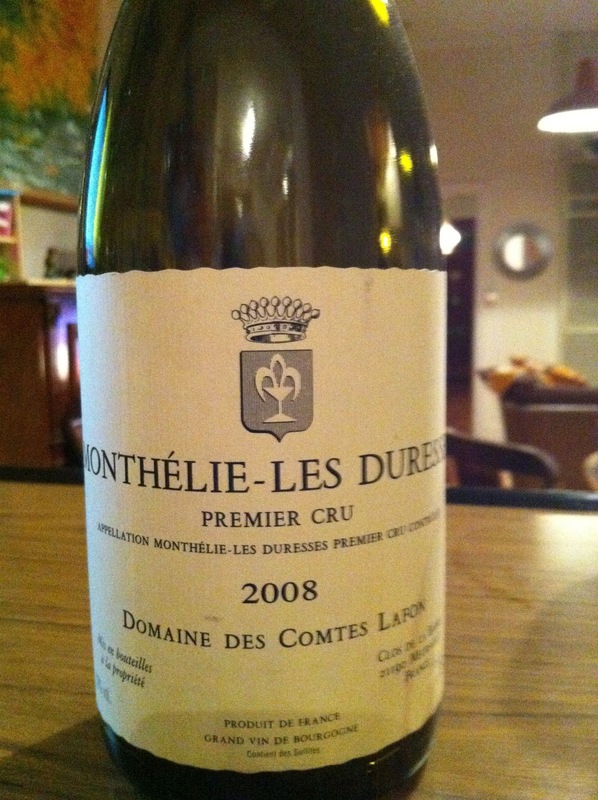 Another City Wine Store purchase (actually all the wine in this post is from City Wine Store) was the Monthelie-Les-Duresses 2008 Premier Cru Domaine Des Comtes Lafon. Remember that if you can! One of the things I really like about the Premier Cru wines is that the websites usually have a map of the local village showing where all the individual vineyards are located, Monthelie-Les-Duresses is shown here. I like the idea of using this simple map to find the google map satellite images to get a feel for the area in which the wine is produced, hopefully this link works (unfortunately there is street view of the actual appellation). The Les Duresses appellation is right in the centre of the screen with the village of Monthelie to the right of screen (the google map is rotated about 90 degrees to the map on the Monthelie website). Also of interest to some may be this link which gives you a simple description of the viticulture of this appellation. My notes on this wine are a bit more formulaic but I will reproduce them here for those interested. Overall I found the Monthelie-Les-Duresses smooth and subtle (perhaps a bit too subtle) with an aroma and flavour of spice and oak and a mild touch of red fruit. It also displayed a nice level of tannins that were most noticeable toward the back of the palate. I decided that this was not a complex wine, rathe it was quite light and simple. I do acknowledge that at 2008 it may have been a bit young and as with most well made Burgundy would benefit from a few more years in the cellar. However, until wines with 10 years of age are available at a non astronomical price I will have to settle for drinking them a little younger. This wine was around the $80 mark which I think is pretty cheap for a Premier Cru Burgundy. 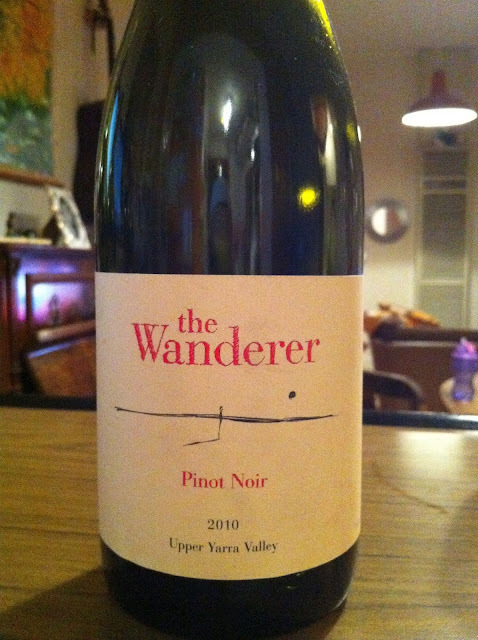 The last wine of this post is The Wanderer 2010 from the Upper Yarra Valley. Unfortunately I do not have any notes about this wine so I have to use my memory which is not great so this is going to be short and simple. The sommelier informed that in his opinion this is one of the best Pinots from the Yarra Valley so with that recommendation I had to give it a go, I think it was around the $40 mark. This wine displayed excellent flavour and lovely smooth tannins for a wine so young. It was pretty typical to the Victorian style of Pinot and I enjoyed it immensly. In conclusion I rated it Great. I don't drink much Yarra Valley Pinot so I am happy to agree with the City Wine Store sommelier that this is one of the better Yarra Valley Pinots out there. In saying that, I think it could find some tougher competition if it went up against many of the other Victoria Pinot regions, namely Macedon Ranges, Mornington Peninsula, Bellarine Peninsula and of course Gippsland. In summary, as for which is better, French Burgundy or Victorian Pinot? I think it comes down to personal preference. I have a few ideas about what I enjoy in both regions and what I look for when tasting them. So far I have come to the conclusion that Victorian Pinots drink better than their French counterparts when they are a bit younger. Albeit that they are very different in style and definitely far more fruit driven. I find the French Burgundy much less fruit dominated and more refined in construction (by refined I mean more processed, filtered, fined etc), more emphasis seems to be placed on the developing the tannins and acidity. So far I have found the Burgundies to be more oak and spice and the Victorian Pinot more fruit and floral. Sadly I have not had the chance to try a well aged Victorian Pinot as they seem to be as rare as hen's teeth. I am guessing that this is due to the smaller lot sizes of the Victorian producers but in saying that if anyone has a hot tip about where to buy a great aged (8 years plus) Victorian Pinot please contact me immediately!